My son started to take lunch to his school from last week. first i was very tensed on how he will adjust to eat all by himself. then i was worrying on what to pack for him. In this chennai climate, my curd rice could not withstand, even if i add lots of milk and less curd, climate spoils it! so our most comfort food curd rice cannot be packed for lunch! Past week was like a research period, as i am finding out, what he eats, what he brings back home, what he doesn't even touch and stuff's. till now, vegetable pulao is one safe food to pack. have to find out more. today i tried this fried rice, both my hubby and my son liked it very much and the boxes came empty. update: Now my son asks me to pack this fried rice quite often. Last year i completely enjoyed my life along with this sweet blog, which gave so many nice friends. This year, i have few resolutions, of making my cooking with less oil, with less sugar. when i said this to my hubby, he said, don't make me feel old so soon. Then i just left the Sunday's as exceptions. I don't believe in implementing the resolutions right from Jan 1st. I planned them well before and am practicing for the past one month. 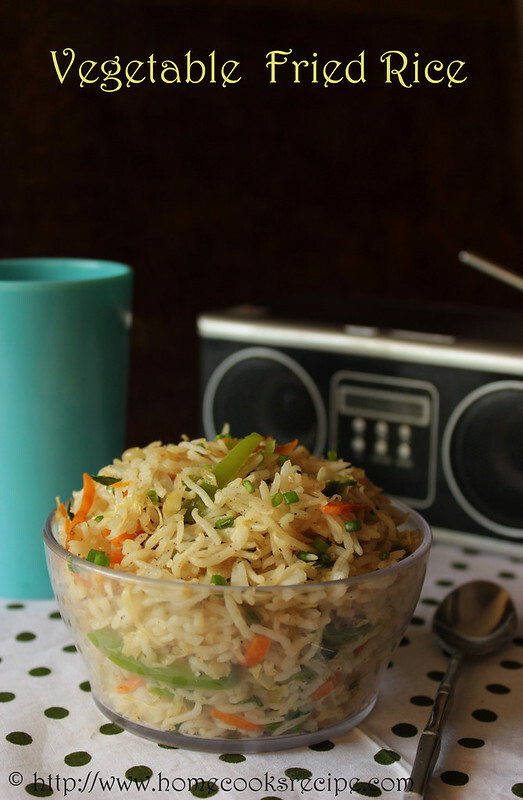 This Veg Fried Rice, really impressed me, as it can be made in minutes and also i feel the nutrients in these veggies are not omitted, just by sauteing them till semi-cooked. I am sending this off to Eat Healthy-During Pregnancy Event. Measure Basmati rice in a cup and set aside. for 1 cup of basmati rice, you need 1 and 1/2 cup's of water. so measure the rice and water accordingly and set aside. Wash and soak the basmati rice for 10 minutes. then drain the water completely. In a Pressure cooker, add 2 cups of water and place a bowl of basmati rice along with measured water. add 2 drops of vinegar or lemon juice and little bit of salt for rice. close the cooker with its lid and put on the weight. pressure cook for up to 2 whistles exactly. once the steam escapes, open the lid and remove the rice to a plate and wide spread the rice. add 1/2 tsp of sesame oil and mix the rice with a fork gently. Cut the vegetables into very thin strips. use the spring onions, onions also. it gives a good taste to the fried rice. if not use small onions or white onions. In a pan, add 2 tsp of sesame oil, add finely chopped garlic, then add onions and saute till they turn translucent. then add carrot and saute it. then add the capsicum and the cabbage. saute them, till the vegetables are half cooked. add very little salt and 1/2 tsp of pepper powder to the vegetables for taste. finally add 3 drops of soy sauce and mix with the vegetables. switch off the flame. Add the cooled rice to the pan and mix well with the vegetables. finely chop the spring onions(green part) and add it to the pan and mix well. do all the mixing, when the vegetables remain hot. Transfer the fried rice to the serving bowl. It is almost a rule for me to add spring onions to the fried rice. also make it a point to finely slice the vegetables. You may add a bit of ajina motto at the end. but it is best avoided. We add mustard in our cooking, to remove if any poison present in the food. Before adding the mustard, check whether oil is heated and after adding the mustard let them splutter. this just takes less than a minute. Over the years mustard has been prescribed for scorpion stings and snake bites, epilepsy, toothache, bruises, stiff neck, rheumatism, colic and respiratory troubles. 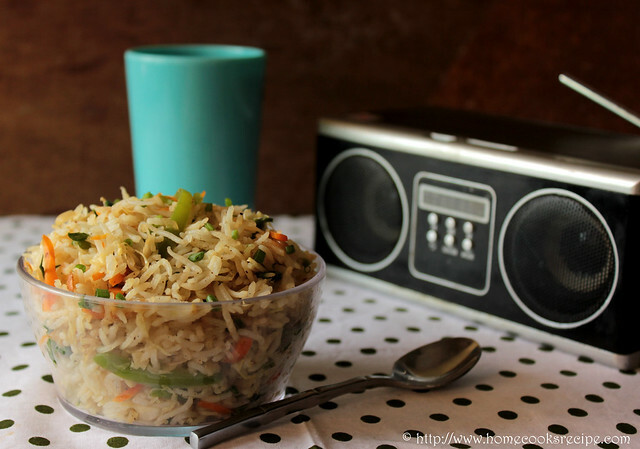 This is similar to the leftover rice upma I prepare, and we love it! Thanks for that tip - I did not know this! What an intricate detail! Is this simple food to you, looks like great food to me....awesome click. Love the colorful veggies just delish! first time here. rice looks colorful and yummy. i also prepare it this way.. just adding pepper does give a nice taste to the rice. Thats a nice resolution! The fried rice looks so colourful and delicious! Wish you a happy new year! Warm Welcome to my Blog Malathy, Hope to see you more Here. Yes Malathy, Bell Peppers is known as Capsicum. Capsicum and spring onions are must vegetables for fried rice. you can use green capsicum, if you dont find red or yellow one's. most of the asian countries that i visited they call it Bahao. its same as what is in the picture. blog. Now I am expecting more good tutorials from.